Home Other Articles Soccer: Why Is Soccer So Popular? 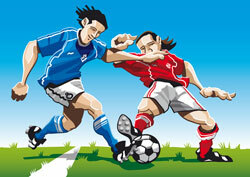 Soccer, or football as it is known throughout the world, is the most popular sport and requires a huge amount of skill. It creates fanatical fans, and throws the world's biggest sporting tournament, the FIFA World Cup. But why is it so popular? One of the major reasons is the relative simplicity of the World Game. All that is required to play is two teams and a small round ball. This makes it the only sport that can be played in many developing nations. And it is from these nations that some of the best players come. The rules are also easy to learn: don't use your arms, and kick the ball into the net. The hardest rule to memorize is the offside rule, but even this can be understood after only a single game. It is these few requirements that make the game of soccer so exhilarating. Nearly all the countries in the world have a soccer league, and most nations try to qualify for the World Cup. This particular competition is broadcast to every corner of the soccer community, and makes die hard fans out of all. Soccer takes nature hand-eye coordination and develops it into pure skill. This is another reason for the appeal of the game. Huge amounts of money are spent in securing the best players throughout the many clubs, and an individual player can be worth more than 50 million dollars. This gives hope to many young players, and continually builds the media coverage of the game. Australia is a prime example of soccer taking hold of an entire nation. There is a small soccer league, but it is still in its first year. They have made the World Cup for the first time in 32 years, and yet their first game against Japan beat the State of Origin in television coverage. The State of Origin is the most popular sporting event in Australian culture. It is this kind of aura that gives soccer its influence of the world. In 1985, Stafford Heginbotham said, "Football is the opera of the people." This puts the entire world soccer appeal into perspective. It can be played by anyone, not just the rich, not just the upper class. Anyone and everyone can and does play this game. Soccer is growing in participation and viewing numbers. Hundreds of thousands of people watch the game regularly, and millions tune in during the World Cup to see their heroes play. And it is easy to see why. Soccer is often called the beautiful game because of the skill needed to be able to compete in the top leagues. Players spend thousands of hours perfecting their art. The ability to have full control over a small ball is highly sought after. Being able to kick at high speeds and with great accuracy can set a player up for life. Because anyone can play professionally, if they are dedicated, then hope is given to youth throughout the world. They can break free and achieve great things, but only if they put in the effort. This mindset teaches determination, faith, and that if you strive for your dreams you can achieve anything. These characteristics are taught by the game of soccer, and is one of the many reasons why this beautiful game is so appealing to the masses.